An ad infinitum judgment of isolation is pinned to the town by the immutable saw-toothed ridges of the Absaroka and Beartooth Mountain ranges. As I step outside the truck to see the town from the proper height, the eclipse from a large tree envelops me in its satiny cold field. A puff of wind pushes strands of hair into chapstick. Clawing to locate and extract them, I step from the shadow into the light. Cars stowed on concrete porches, lower story windows boarded against a late afternoon sky alternating between aureate October lightness and winter gloom shedding snow like a strip tease, make for an ambiguous sense of place. Lamps in upper story windows toss beacons of welcome. But the one sound – sips and sighs of intact blankets of smoke hanging above each chimney as they’re forced to separate and dissipate, arrests any notion of coziness. Make no mistake, winter here is serious and it’ll not stand for an outsider’s romanticized projection of it upon a town it’s preparing to overtake. It stamps the ground with a suffocating updraft; a demand for respect. No faces have shown themselves and as I begin in earnest to discover one, I wonder if the 2nd coming hasn’t occurred during my drive from Cody, Wyoming leaving me the only hapless soul in town. 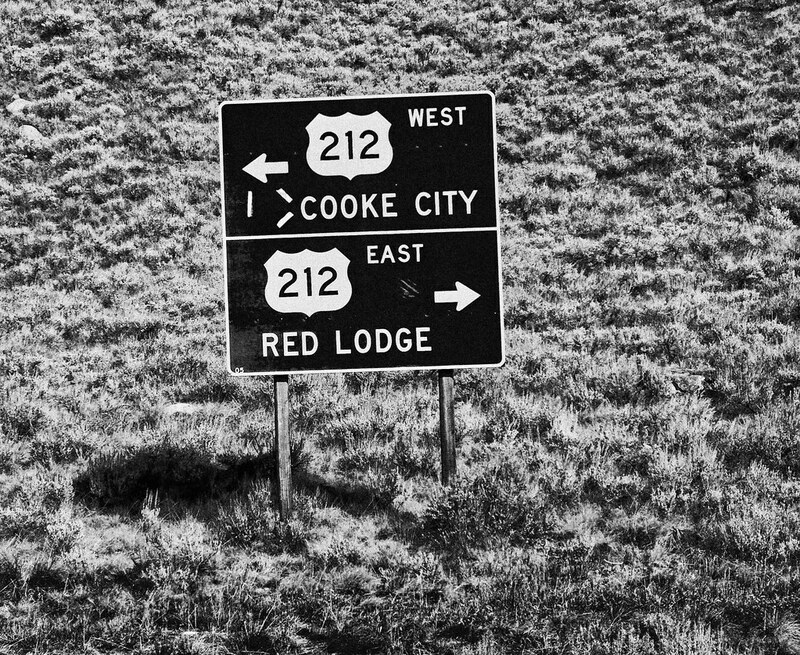 There is but one road into Cooke City, Montana from the outside world. The wildness of Yellowstone’s Super Caldera lies on the other side. This is the end of the road. As I glance over a shoulder to see my exit darkening, I feel simultaneously favored and cursed by the chimerical scene before me. 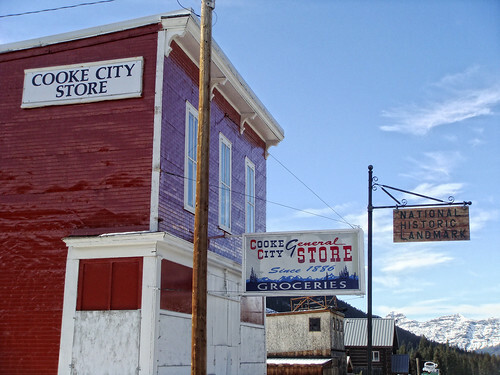 I consider the effort to clamor into the Cooke City General Store for food (do boarded windows have adequate finger/footholds?) and try to imagine the eventuality of being eye level with 2nd story windows, elevated there by a platform of snow. Like lying on your back, head dangling from the edge of a bed while pretending the floor is the ceiling, the ceiling the floor, it’s a strangely appealing, altered perspective. 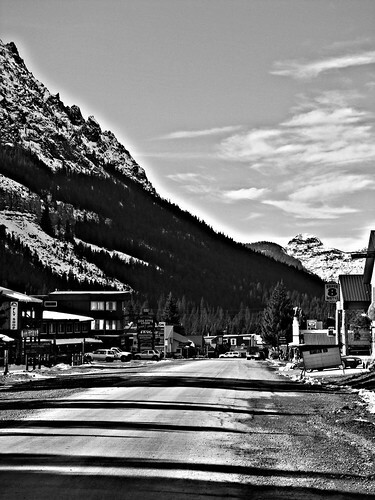 Cooke City, Montana has done with its remote birthright what it could. First mining, then Yellowstone National Park. 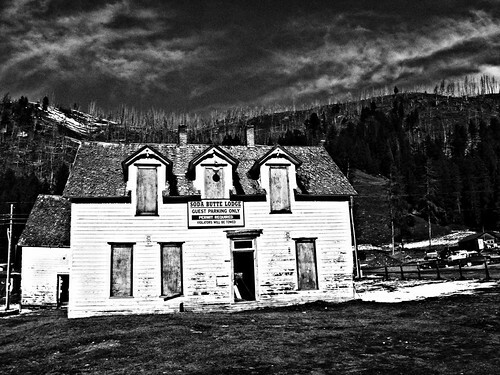 Originally named Shoo-Fly, the mining town was renamed in 1880 in an attempt to flatter a Northern Pacific Railroad executive into putting a stop there. Coming over BearTooth Pass at 10,974 feet on Highway 212 out of Red Lodge, Montana or Dead Indian Pass, 8,066 feet on the Chief Joseph Highway out of Cody with views of the Absaroka’s Pilot and Index Peaks (11,708 & 11,313 feet) should have given the townspeople clues as to the outcome of their flattery – no way, no how. In 1877 this country helped hide the Nez Perce Chief Joseph and his 800 or so band of hold-outs from General Howard’s 2,000 strong Cavalry for three months. Railroads don’t go where outnumbered bands of undersupplied men on horseback can elude a United States army for months. Cooke City has a year-round population approximating 100. Three hundred cavort on the one paved street in the summer months of July and August. Even though it’s considered Yellowstone’s Northeast entrance gateway community, Silver Gate, a few miles past Cooke City, actually claims the ranger station. Take note, if you’ve not entered the Park through this least-traveled entrance, you’re missing a lot more than a momentary gut-check about the 2nd coming. 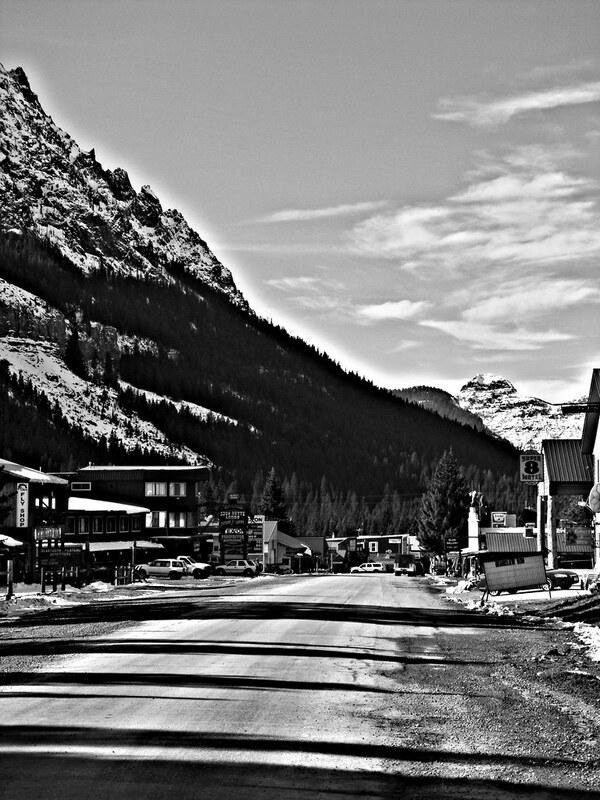 Yellowstone’s wildness is epitomized by this small community and the drive to get here. Snow poles stand alert and ready. Yellowstone’s original entrance in Gardiner, Montana, and the only one open year-round, is framed by the Roosevelt Arch. While all the literature points out this entrance is the only one open all year, few state why. 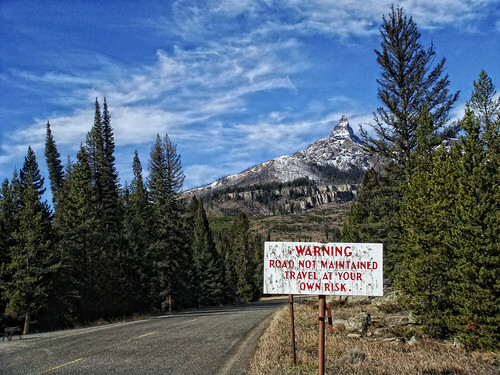 The annual snowfall in Gardiner approximates 30 inches, while the rest of the Park averages 150 to 400 inches, depending on elevation. And once entering the Park from Gardiner you’ll be met with closed roads during the winter over much of the Park. So schedule a Snowcoach tour and do your homework if you’re planning to see Yellowstone during the winter (a highly recommended journey). 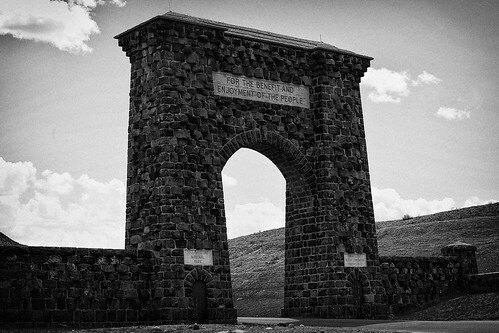 Dedicated in 1903 by President Theodore Roosevelt, who was already on vacation in the park when asked to lay the cornerstone, the arch is 50 feet high and made of locally quarried basalt -- plentiful since Yellowstone sits atop one of the earth's largest volcanic hot spots. 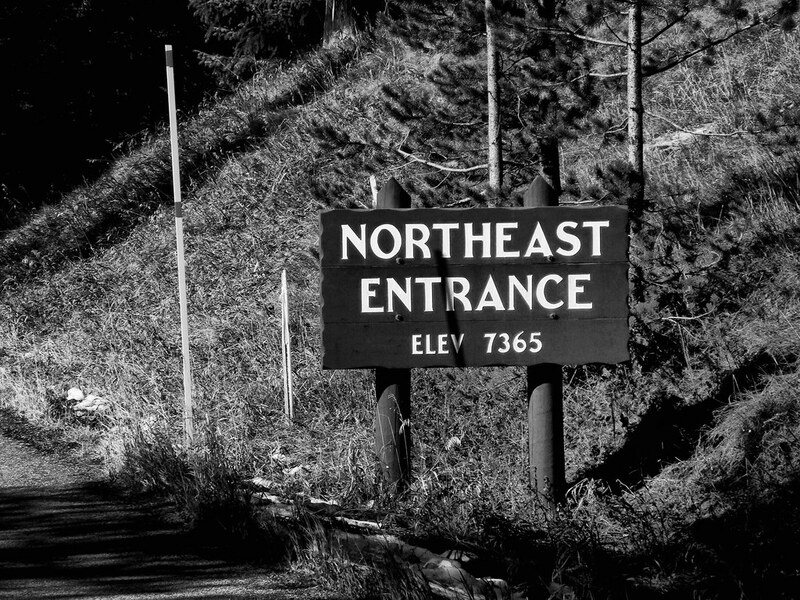 The arch was erected as the formal entrance to the Park in 1903 since most visitors arrived via the Northern Pacific Railroad’s nearby stop in Cinnabar, Montana. Stagecoaches made the remaining short trek to Gardiner. I cannot imagine arriving there by railroad. I cannot imagine arriving there by any means of transportation of the day. The ground boils beneath you while the mountains always coddle snow on top. Were it not for modern climate control’s tempering of these extremes, conditions would be brutal most anytime of the year. While the arch may be Gardiner’s claim to fame and really the only thing of note to see there, it’s worth a stroll to see some of the older parts of town. 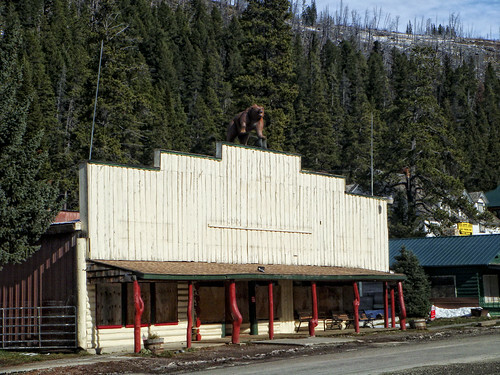 The Flying Pig Camp Store has internet access and bear pepper spray, an important combination you’ll see frequently in these parts. There’s plenty of lodging, restaurants, and outfitters so it’s a well stocked and not overrun base with which to explore Yellowstone. Gardiner is 53 miles south of Livingston. Bozeman is 26 miles west of Livingston on Highway 90, providing the only airport in the area serviced by major airlines (most seasonal). Billings’ Logan International Airport (BIL) is 117 miles east of Livingston on Highway 90 and offers a much broader array of scheduled flights on major airlines. 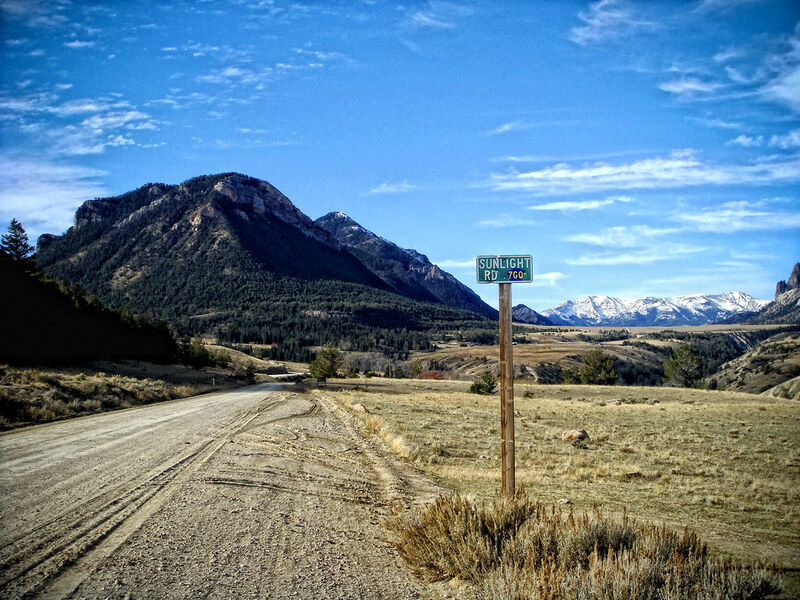 Mammoth Hot Springs, 5 miles south of Gardiner is the Park’s headquarters and an eye opening welcome to the ancient, wild world of Yellowstone. 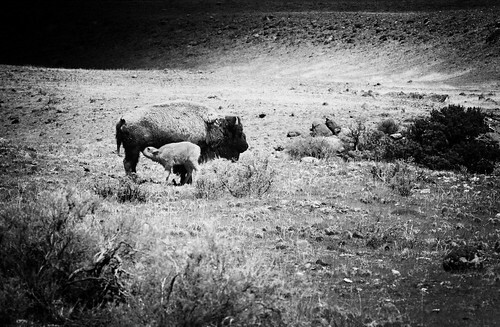 From mid-April to early June, bison new-borns dot the ground. Bison is the correct scientific term for the North American species, but “buffalo” has become an accepted synonym. In the seventeenth century, French explorers in North America referred to the new species they encountered as “les boeufs”, meaning oxen or beeves. The English arriving later, changed the pronunciation to “la buff”. The name grew distorted as “buffle”, “buffler”, “buffillo”, and, eventually, “buffalo”. Yellowstone has the largest free-roaming bison herd in the world, estimated at 3,500 head. Female bison's gestation period approximates 9.5 months. Twins are extremely rare. At the turn of the 20th century the bison herd had been slaughtered from a high of 120 million to less than 30. Today they approximate 500,000. Bison are a ruminant similar to cattle, in that they chew their cud. They can weigh up to 2,200 pounds and run at speeds up to 40 mph. Talk about mass in motion! 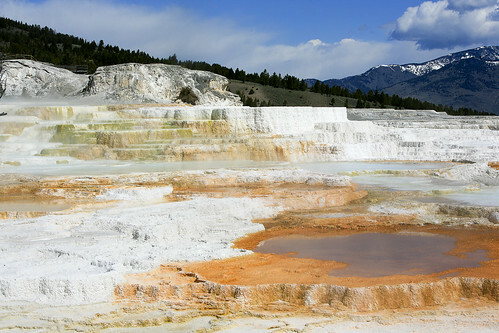 Mammoth Hot Springs - all about extremes. Heat, water, limestone, and rock fracture combine to create terraces of travertine. The travertine is deposited as white rock, but microorganisms and living bacteria create beautiful shades of oranges, pinks, yellows, greens, and browns. The terraces are constantly changing. 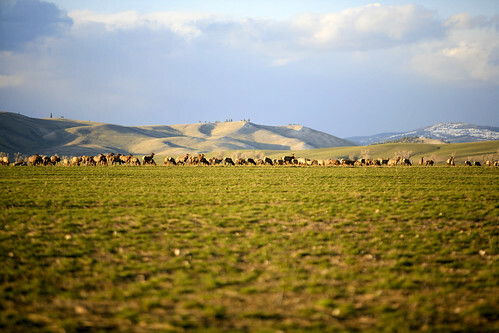 No discussion of Mammoth Hot Springs/Gardiner would be complete without a reference to the Elk that migrate in early fall when the weather cools off and they re-emerge from the coolness of higher elevations. If you stay at the Mammoth Hot Springs Hotel, your day will begin and end with the eerie, wild sounds of male Elk bugling for the rut and a change of seasons. It’s a sound I recommend everyone hear once; it’s unforgettable. Wapiti; not a petting zoo.